Open Heaven 26 October 2018 Prayer Points on Today – Who is my neighbour? 3. Father, please help me to add the virtue of good neighbor to my faith, so that the light of Christ may shine through me to the word. 4. Holy Spirit, help me to add virtue to my faith, in Jesus’ name. 5. Father, let every spirit of stinginess, in my life, towards people around me, be consumed by Your fire, in Jesus’ name. 6. Father, no matter the level of affluence and comfort that I may attain in life, please, keep me focused on my primary assignment, which is to serve You and win souls for Your kingdom, in Jesus’ name. 7. Father, empower me to lay up my treasures in heaven, where they are well secured against rust and thieves; and not on the mundane and ephemeral things of this world, in Jesus’ name. 8. Father, You are the Almighty God, who specialises in doing the impossible, please, let every seemingly intractable challenge in my life, family, career, academics, etc, receive divine attention and solution, today, in Jesus’ name. 9. Father, please, bestow, more, on me, blessings that surpass what money can buy, and cause me to be rich and generous, toward You and Your kingdom, in Jesus’ name. 10. Father, please, make me to live this day, without committing a single sin, in Jesus’ name. 11. Father, please, grant Pastor E.A. 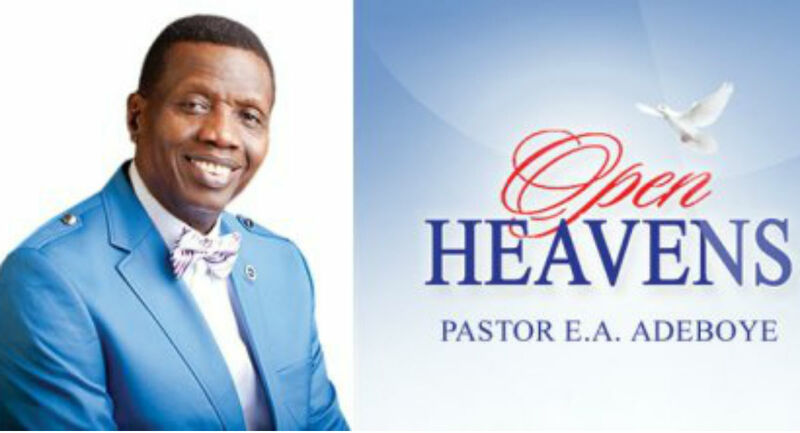 Adeboye, divine health, divine wisdom, divine protection, journey mercies and long life, as he goes round the world, promoting the business of Your kingdom, in Jesus’ name.